It’s that time of year. Sniffling, coughing, visits to the doctor…we know this routine all too well during the winter months. I don’t know about you, but I can never have enough get well cards on hand this time of year. So, today I thought I’d share some easy and clever get well card inspiration. 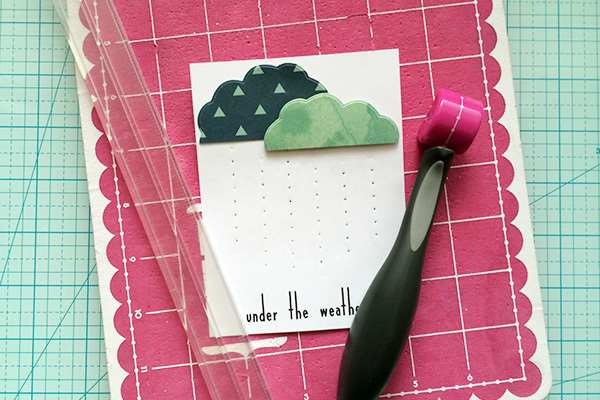 If you’ve been following this blog for a while, then you know I love to find multiple uses for my craft supplies. So, since I didn’t have a cloud shaped die, I decided to use a basic Nesting Frame Die instead. 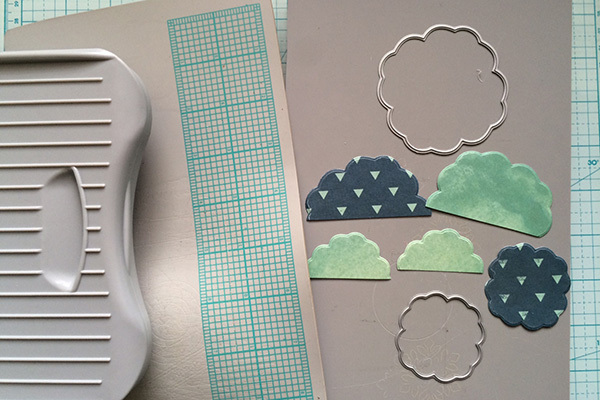 I simply cut out the frames, and then cut off a couple of sections in cloud shapes and added them to my card. 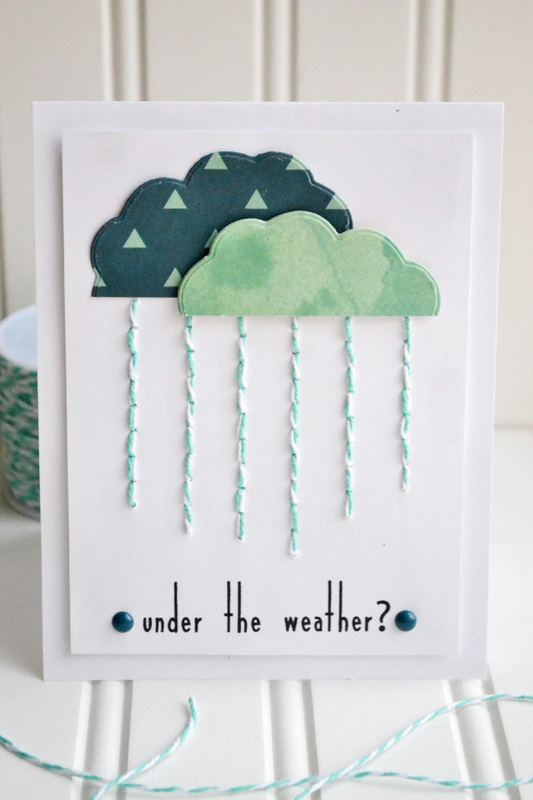 To create raindrops I used my Sew Easy Tool with the straight head and stitched through the holes with Aqua Baker’s Twine. I love the texture the stitching adds to the card, and the baker’s twine creates a unique look. I created the sentiment using my computer and printed it before trimming my card background. The stitching on the card creates some bulk on the back so I used foam squares to take care of that. A couple of coordinating enamel shapes add emphasis to the sentiment. I’ve got a sick neighbor who will be the recipient of this card, and I’ve got a few more friends and co-workers who are feeling “under the weather” in mind for additional cards. Being a working mom of 5 means that my free time is very limited. 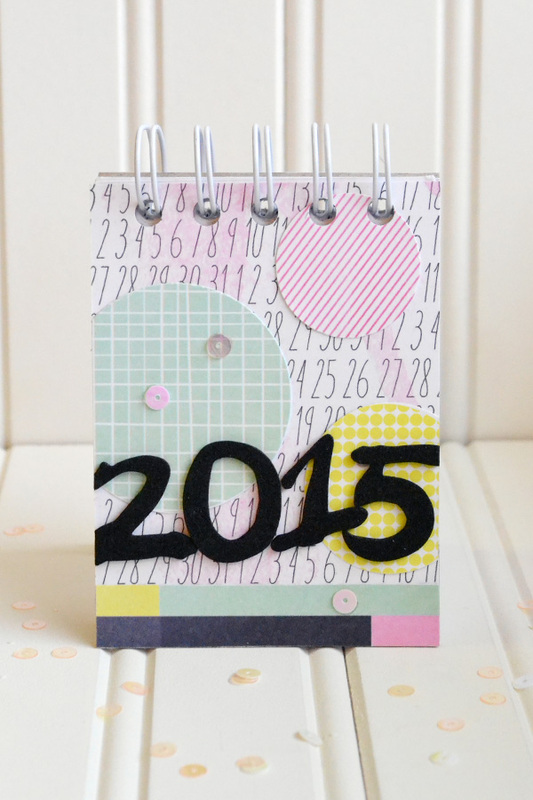 And that also means that I don’t always have time to “keep up” with my scrapbooking and memory keeping. (Really, is anyone completely “caught up” anyway?) 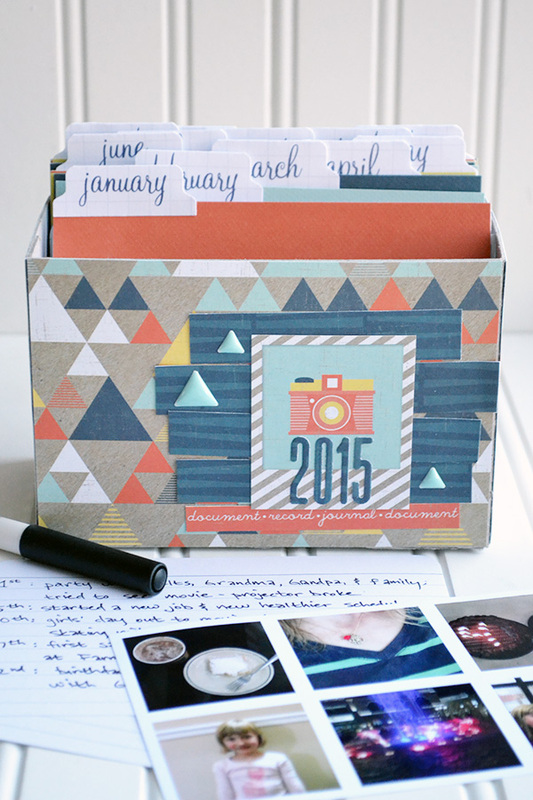 Sometimes it takes me a while to get photos and memories onto a scrapbook page, so in order to keep those photos and memories fresh and organized I decided to try a new system this year–a memory box! I’ve seen this idea in various forms floating around Pinterest and the blogosphere lately and I really love it. So, after looking at several different systems and types of memory boxes I came up with one that I think will work for me. 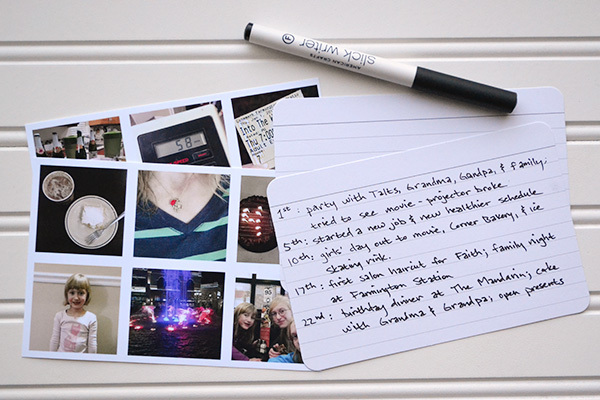 The idea is that I record memories from each month of the year on Grid Journaling Cards, and then print my 4×6 photos (or photo collages) each month and store them with the journaling cards until I have time to create a page using the printed photos and hand written stories. 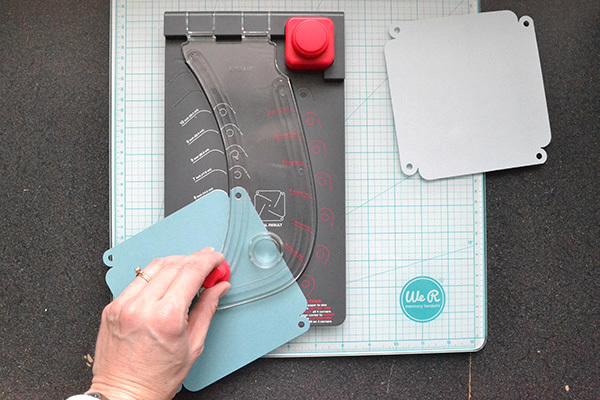 All of the memory boxes I’ve seen have been store-bought, but I tend to be a DIY kind of gal so I decided to use some We R tools to help me create my own little 4×6 filing box. I wanted my memory box to be acid free and archival safe so I used some flexible 12×12 chipboard leftover from some patterned paper packaging. I trimmed two 10″ x 5 3/8″ pieces of chipboard and scored them with my Trim and Score Board at 1″ and 7″. 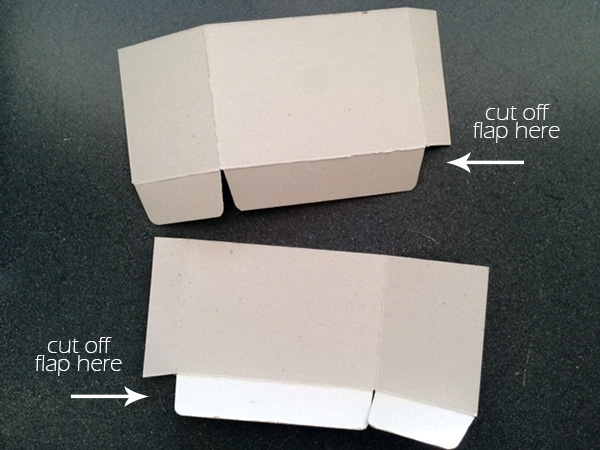 Then I pulled out my Gift Bag Punch Board to help create the bottom flaps of the box. I slid the scored chipboard pieces into the board, lining up each of the score lines with the “start line” on the board, and then punching and scoring only the “horizontal line”. 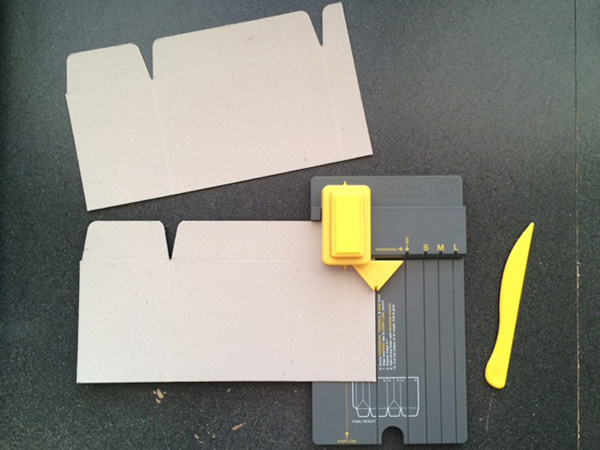 I trimmed off the smallest flap from each piece of chipboard, and this created two parts to the box that were ready to assemble. 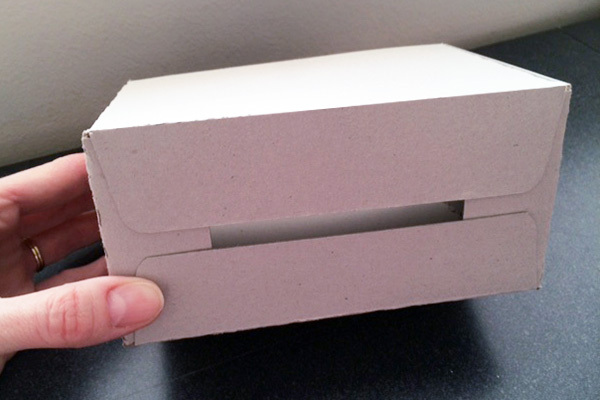 I adhered the two pieces together using power craft tape (you could also use a hot glue gun) and then trimmed a piece to place in the bottom of the box to fill in the gap between the bottom flaps. 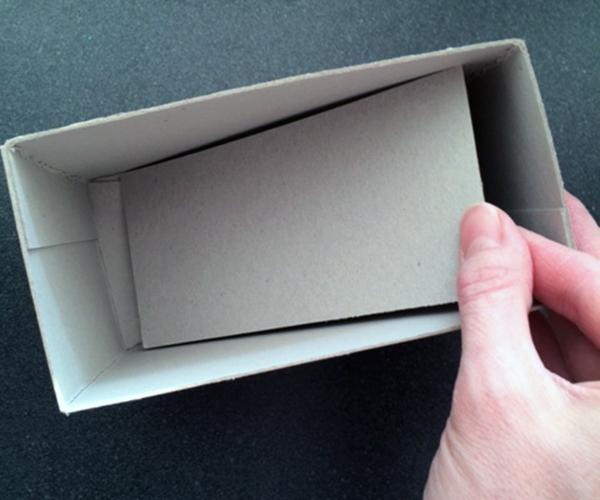 The piece was just 1/8″ smaller than 3″ x 6″ to allow for the thickness of the chipboard when placed inside the bottom of the box. Next I covered the box with some patterned from the Notable collection and added some Enamel Shapes and die cut numbers for the year. 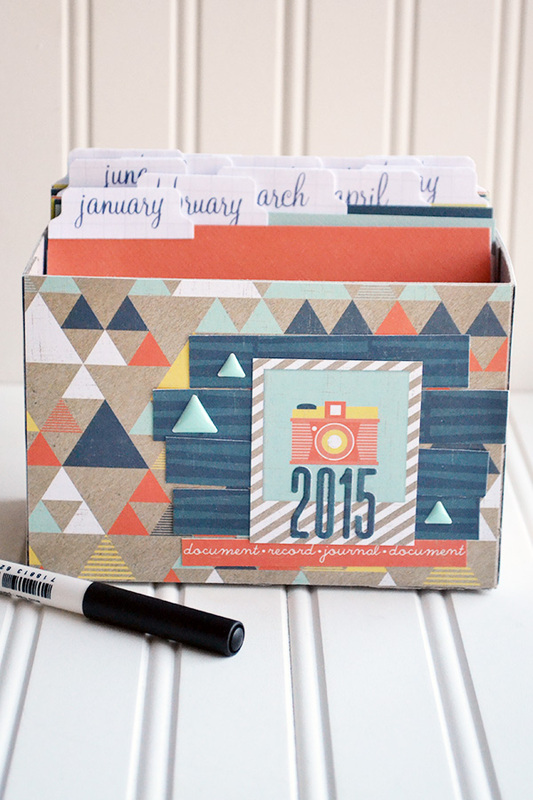 Then I made some dividers to keep my photos and memories for this year organized by month. 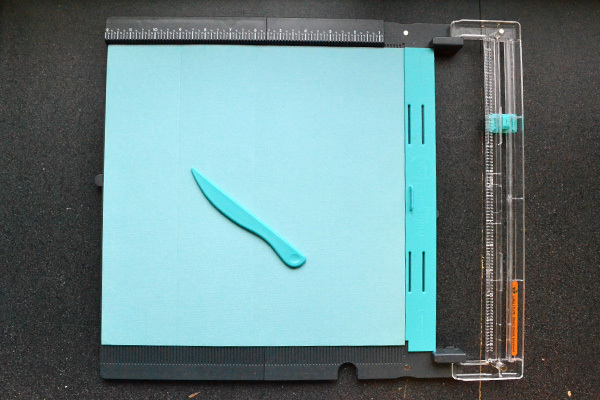 I trimmed some coordinating cardstock to 4 1/2″ x 6″ and then added some file tabs that I made with my computer and File Tab Punch. 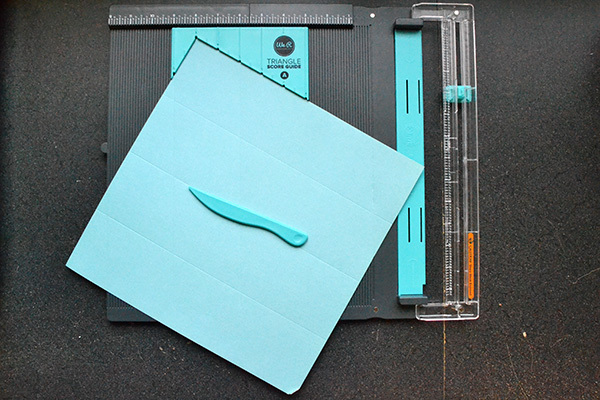 To create file tabs that fold over the dividers I folded my paper in half and placed it in the punch so that the fold was just below the top edge of the punch. You can see where the paper is in relation to the punch shape when you turn the punch upside down. I adhered the folded file tabs to the dividers and added a few 4×6 Grid Journaling Cards to each month so I can record stories as they happen. Then I printed my 4×6 photos and Instagram photo collages and placed them in the proper month. I’ll leave this sitting on a visible and accessible surface in my craft room so that I can easily record memories and add photos as the month progresses. I’m really excited about this new system. 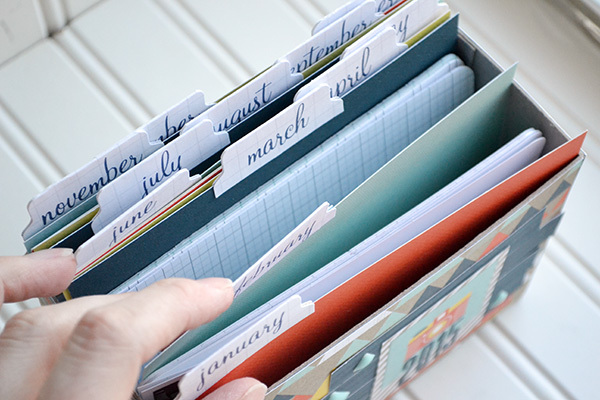 It’s totally easy and low-stress, but will still allow me to keep my photos and memories organized until I can get them into my scrapbook! While recently cleaning out my craft room I came across some leftover cork board coasters that I had used as part of a craft for my daughter’s classroom party. 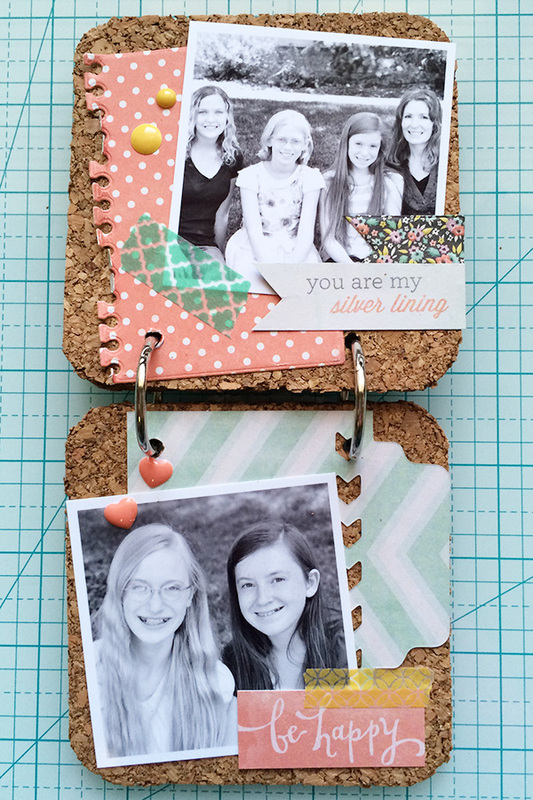 When I saw them I immediately thought they would make a great base for a mini memory book as a gift for grandma! So, I pulled out one of my favorite We R collections from the past, my Corner Chomper, and my Crop-A-Dile Big Bite. Take a look at how it turned out! 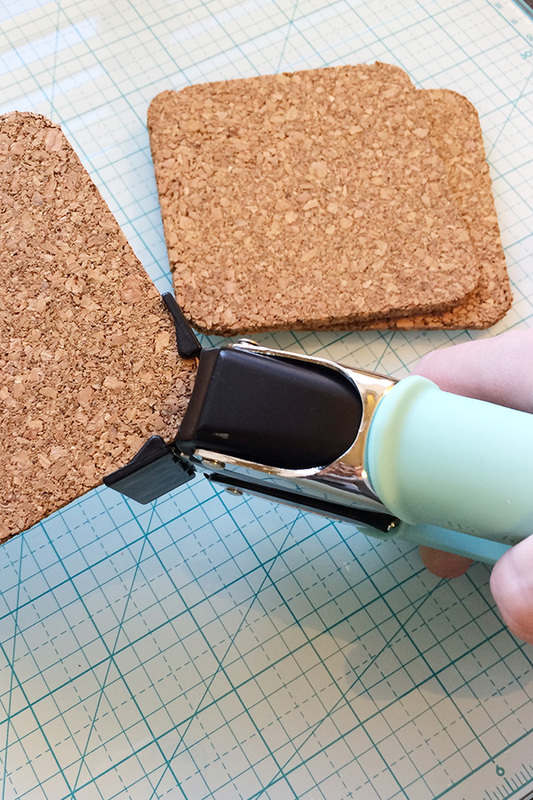 I love the earthy unique look of the cork board coasters. They’re 4×4 and are the perfect size for a gift album. You can find them at your local craft store. 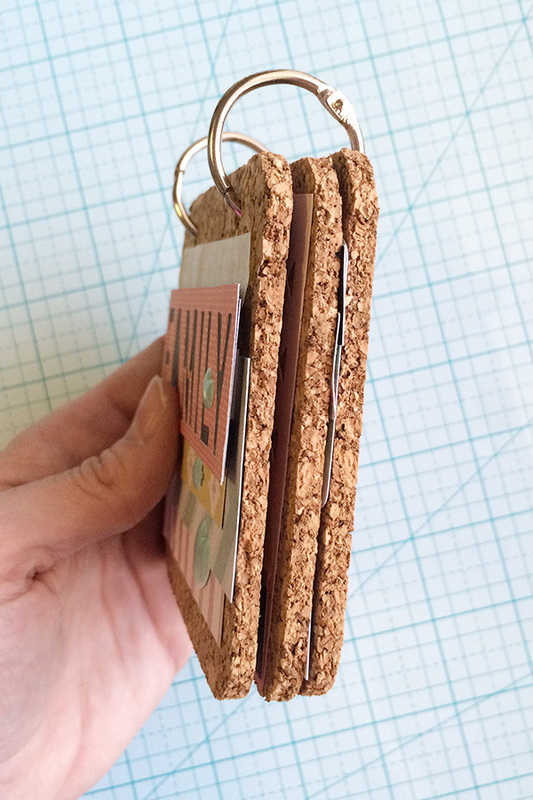 This mini memory book has three coaster pages housing four 2 1/2 x 2 1/2 inch photos of the grandkids, and it’s small enough to fit into grandma’s purse. To decorate my pages I used mostly 3×4 journaling cards and a few scraps from the Chalkboard collection. I included Washi Tape and Enamel Shapes on each page, and layered bits and pieces I cut from journaling cards with my black and white photos. 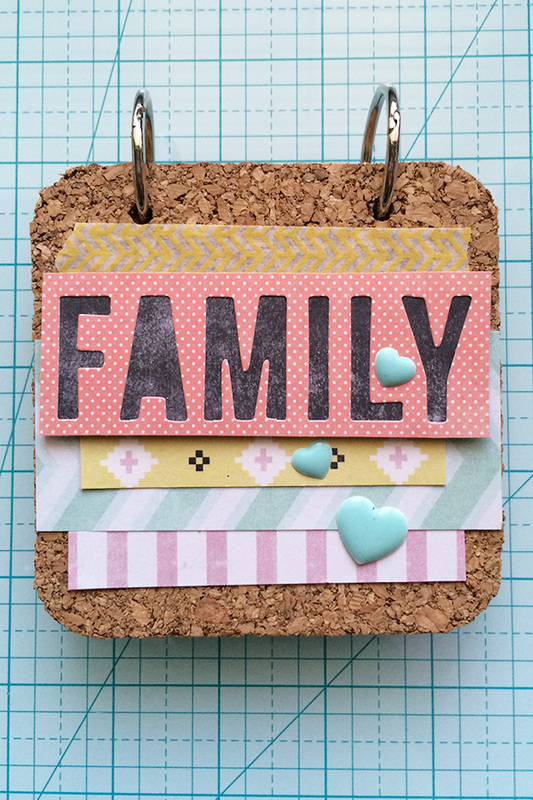 The die cut cards I used from the collection add a great decorative touch, and are super easy to include. I also cut out sentiments and titles from the cards to use on each page. The small canvas size of this memory book helped the project to come together quickly and easily. 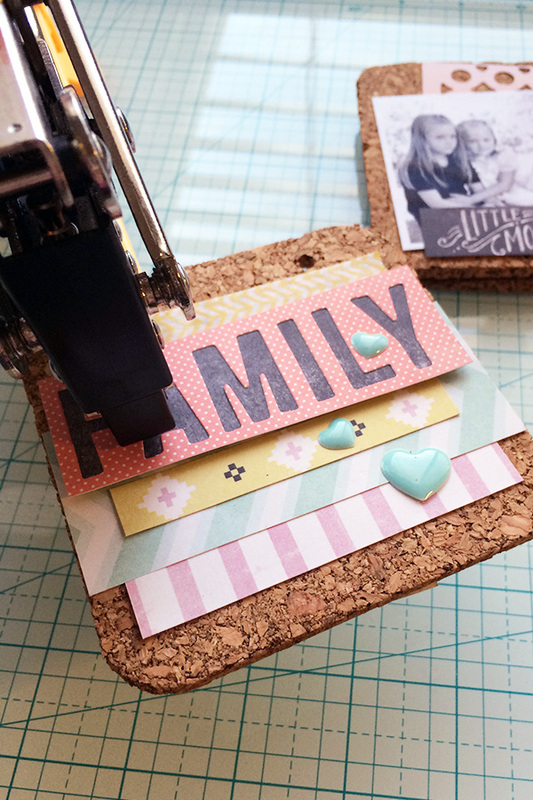 Designer tip: be sure to use a strong adhesive when adhering your papers and photos to the cork board. I wanted my coasters to have a softer feel for grandma, so I rounded the corners with my 1/4 & 1/2 inch Corner Chomper. It cut through the cork board easily! Once I finished decorating my pages I used my Crop-A-Dile Big Bite to punch holes in the top of each page (I measured and marked them first), and then bound the pages using binder rings. You can find those at your local office supply store. I love the added texture of the cork board, and I love how easily I was able to let my creativity guide the project knowing that some of my favorite We R tools would make it possible to carry out my plans. Creative cheers! 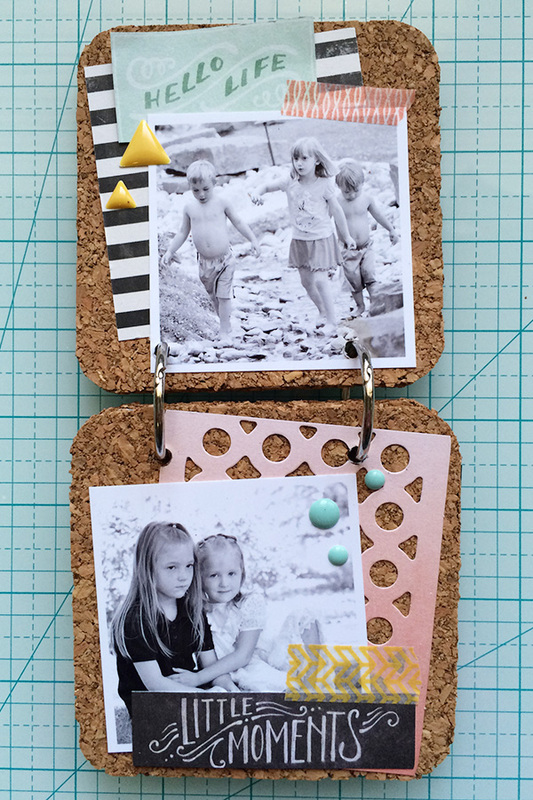 I’ve had so much fun lately using my favorite We R tools to create some decor pieces for my craft room! 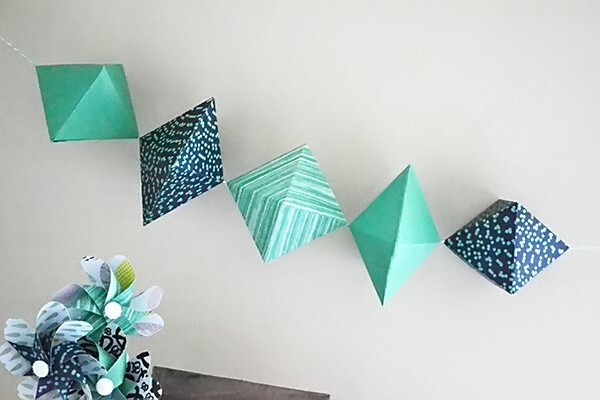 Last week I shared how I used the Triangle Score Guide to make the paper gem garland I hung in my newly re-organized space (if you missed that post you can catch it HERE). Today I’m going to show you how I made the pinwheel bouquet that sits on the little shelf underneath that garland. 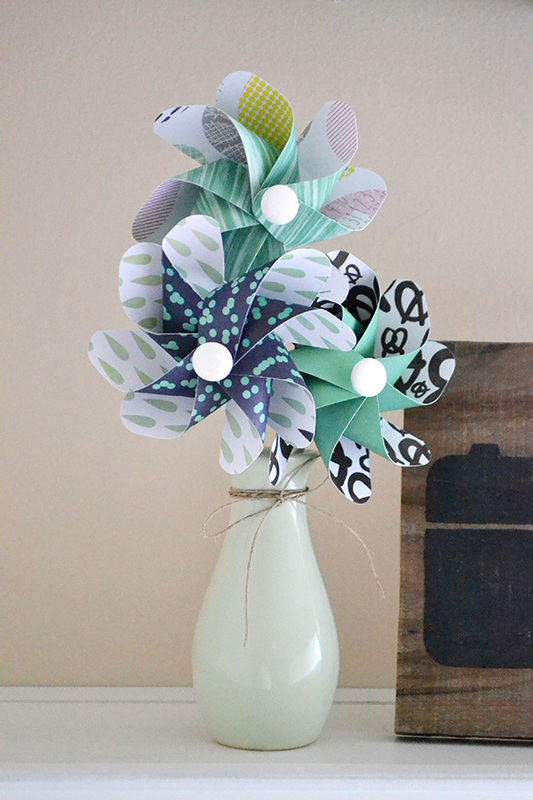 The pinwheels I created for this simple bouquet are double pinwheels, meaning that I layered two sheets of paper together to add twice as many vanes to my pinwheels. I love the fullness of the double pinwheels! I made these using my Pinwheel Punch Board. 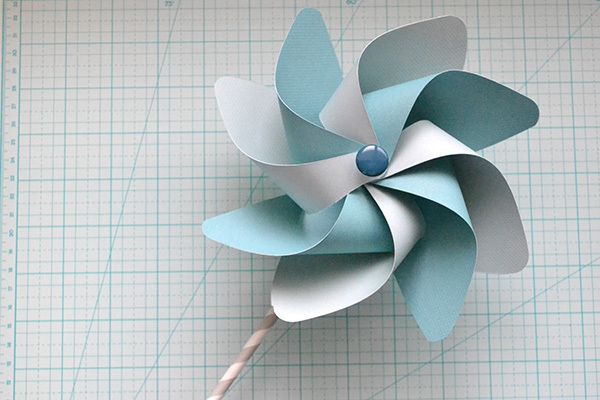 The punch board allows you to make several different styles of pinwheels–simple ones, double ones (like mine), layered simple, layered double, etc. 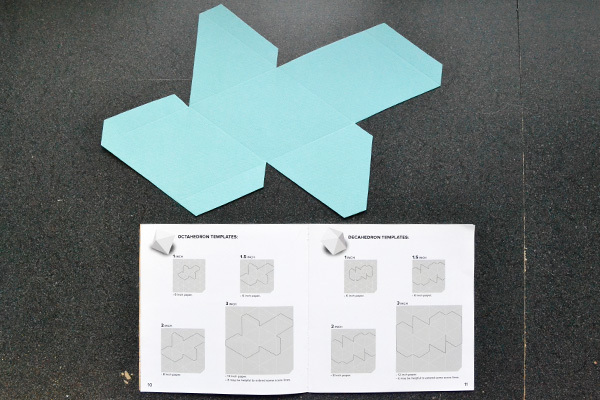 You can use the same paper for double pinwheels, or your can use different paper to have different color vanes. They can be as basic or as elaborate as you’d like! To create these basic double pinwheels, first I cut two sheets of paper to the desired size on the board. (All three pinwheels in my bouquet are 4 inches, but the one I’m demonstrating in this tutorial is 6 inches.) 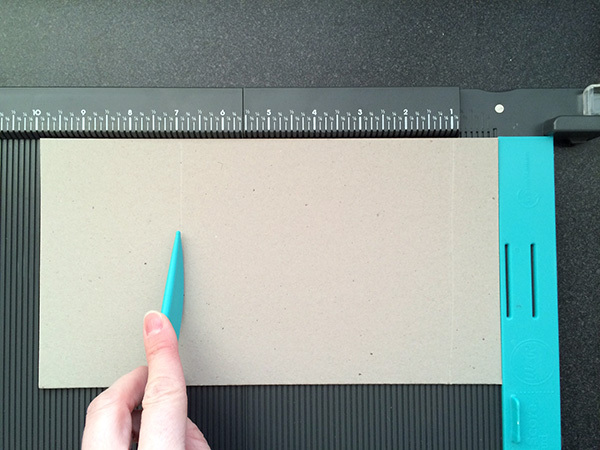 Then I raised the punch board arm, and punched the corners of both papers. Next, I placed the first paper on the board lining up one of the corners with the corresponding measurement from the white templates on the left side of the board. I then lowered the arm and inserted the blade into the track on the left side. I pulled the blade down to the bottom of the track, cutting a pinwheel vane into the paper. I removed the blade, rotated the paper leaving the arm in place, replaced the blade and cut vanes into each of the remaining corners. 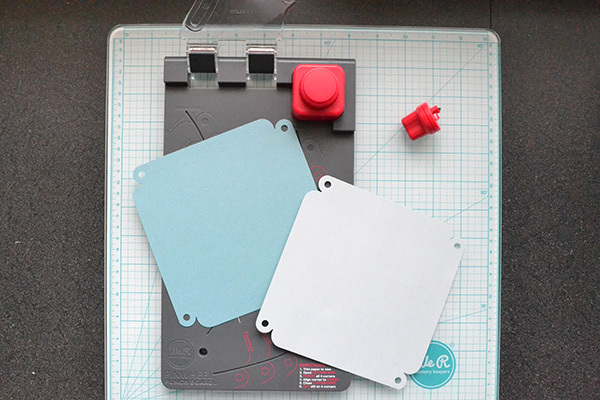 Once I finished with the first paper, I raised the arm and placed the second paper on the board lining the corner up with the corresponding measurement from the red templates on the right side of the board. I lowered the arm and inserted the blade into the track on the right side. I pulled the blade down to the bottom of the track, cutting a pinwheel vane into the paper. I removed the blade, rotated the paper leaving the arm in place, replaced the blade and cut vanes into each of the remaining corners. I layered the two punched and cut papers, aligning them at a 45° angle to each other. Then I used the Pinwheel Attachments to help assemble the double pinwheel. I pulled the ends of the vanes into the center of the pinwheel, placing the punched holes over the pinwheel attachment post. I alternated vanes from the first and second papers, and when I finished I snapped the cap on the end of the attachment post. To finish off my pinwheel I added an enamel dot to the mount on the post, and inserted a grey striped paper straw into the back of the attachment post. 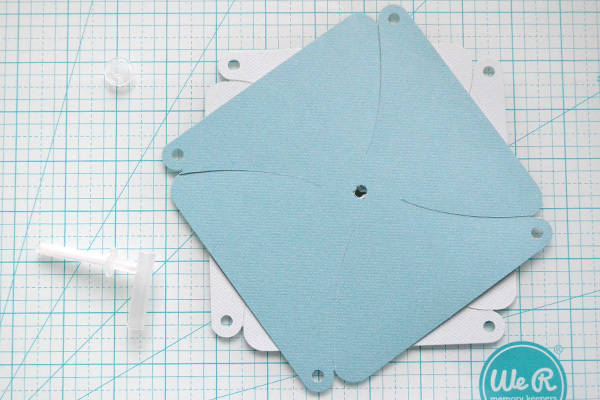 Making pinwheels with the Pinwheel Punch Board is so easy, and the possibilities are endless. 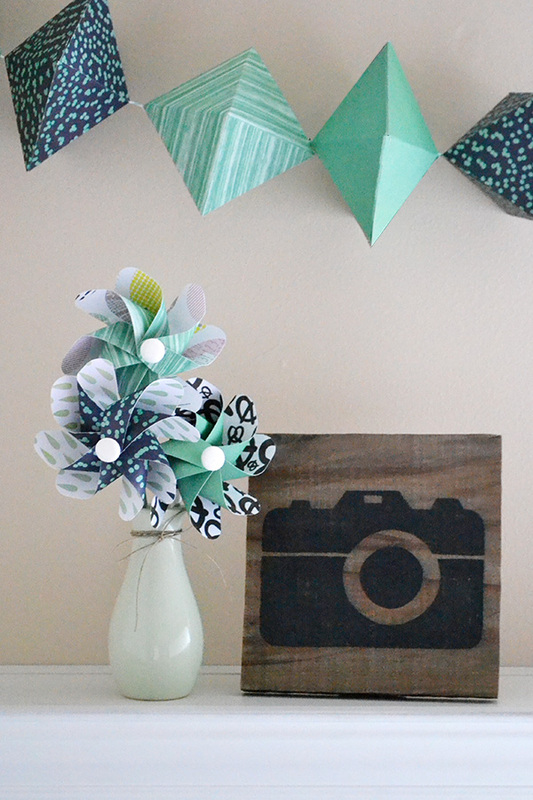 Pinwheels are great for any paper craft project–cards, gift wrapping, home decor, and more! I’ve got some great news for you! We’ve selected random winners for the CHA new release giveaways from last week. Are you ready? Drumroll, please…. LOVE the colors but those balloons are da bomb!! So cute! I spy purple! Love it! I would use to do some layouts of my gorgeous baby girl. Congratulations to you all!! I know you’re going to love these brand new goodies! 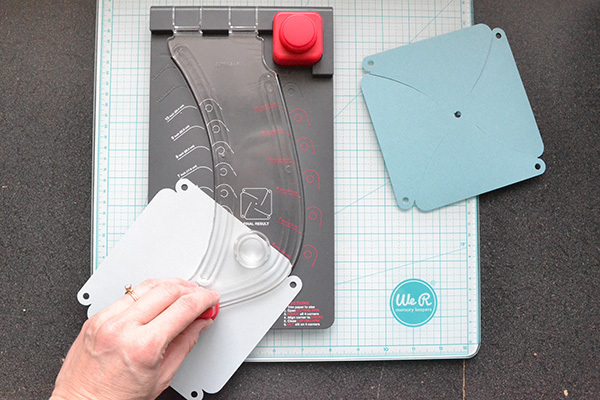 Be sure to share the awesome projects you create with these new goodies on our Facebook page. **Winners, please send an email with your full name, phone number, and mailing address to me: alydosdall@gmail.com. I’ll pass on your info and we’ll get your prizes to you ASAP. Thanks, and enjoy!! I recently re-organized most of my craft room (see the posts on my personal blog HERE), and as part of that I re-did some of my decor. 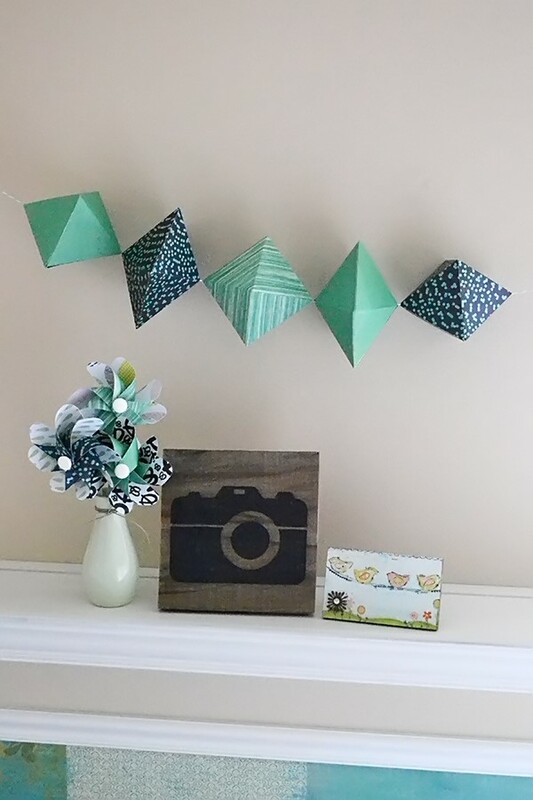 I love the paper gem trend right now, so I decided to create a paper gem garland to dress up a small wall-mounted shelf in one corner of my room. I chose navy and aqua papers from the It Factor collection since they coordinate well with the colors in my space. I alternated octahedron and decahedron shapes in my garland, making them all the 3 inch size. 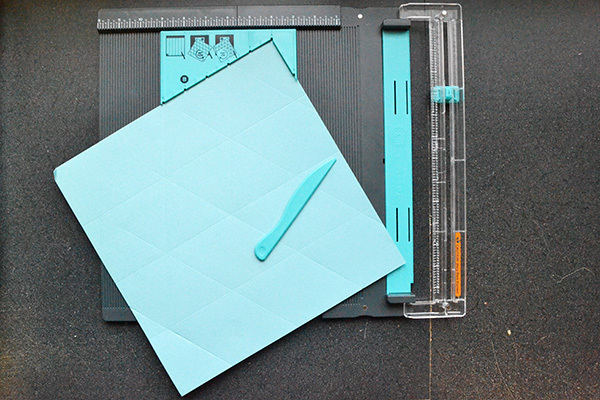 I followed the instructions in the booklet that comes with the Triangle Score Guide, and began by scoring my 12×12 paper on the Trim and Score Board at 3, 6, and 9 inches. Then I removed my paper and placed the Triangle Score Guide on the Trim and Score Board with the “A” side facing upward, lining up the 3 and 9 inch marks on the guide with the corresponding marks on the board. I rotated my paper 60° counter clock-wise and lined it up in the corner of the guide. Then I flipped the blue guide up on the score board and scored my paper at 0, 3, 6, 9, and 12 inches. Next, I removed my paper and placed the Triangle Scoring Guide on the board with the “B” side up, again lining up the 3 and 9 inch marks with the corresponding marks on the board. I rotated my paper 120° clock-wise and placed it in the corner of the scoring guide. I again scored my paper at 0, 3, 6, 9, and 12 inches. Finally, I followed the cutting template shown in the instruction booklet to cut out the paper gems, then I folded and adhered them. Watch for a tutorial soon on how to create the double pinwheel bouquet on the shelf below the paper gem garland in my newly re-done space! I rely heavily upon technology to keep my schedule organized, but I do love having a small desk calendar next to my computer for a quick date reference (and to add a little crafty cuteness to my work space). 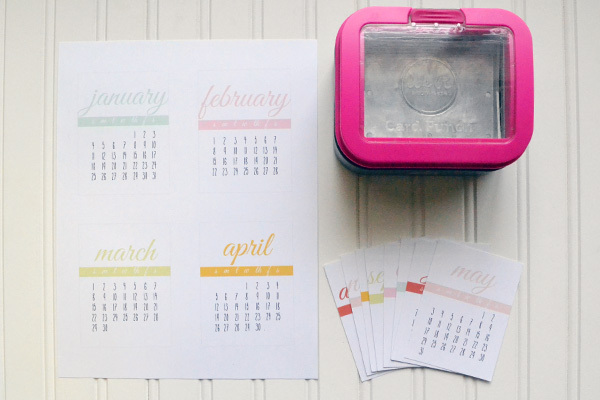 Here’s a quick and easy desk calendar you can create in minutes using our free printable (see links below photo) and some of our most popular tools. 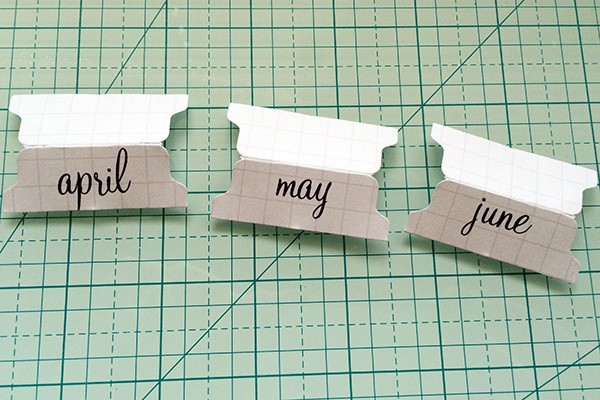 After printing all three sheets, I punched out the monthly pages with my 3×4 Card Punch (Square Corner). 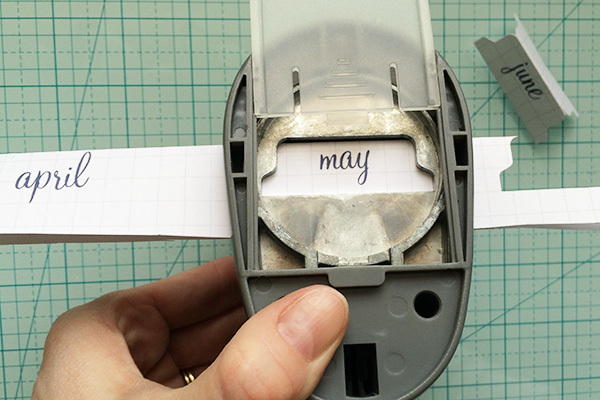 The 3×4 monthly pages are marked with guide lines so you know where to punch, and it’s easy to adjust the guide lines in the clear punch window. 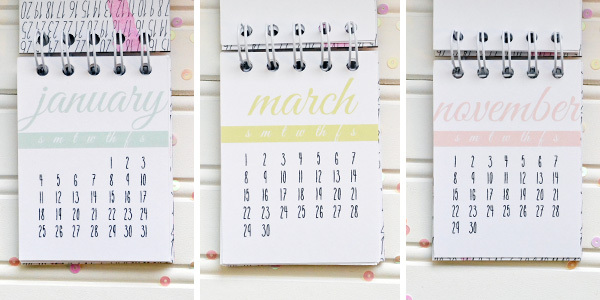 Just adjust all four lines so they are covered by the punch before punching–that way they don’t show on your completed calendar pages. After punching out all of my monthly pages, I trimmed some 8×8 chipboard to 3×4 and covered it with papers from the It Factor collection. I added the date with stickers on the front cover, plus a few sequins, and then bound the covers and pages with The Cinch binding tool. I used white 3/4″ binding wire. Here are some of the inside pages. 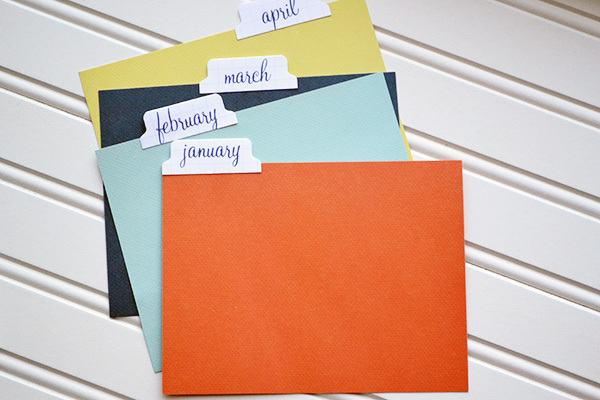 You can stand the calendar up on your desk, place it on a mini easel, or hang it up on a mini clipboard. It’s a perfect size for a gift or for yourself, and it doesn’t take up much work space. Happy 2015 We R fans, and I hope you enjoy the New Year! 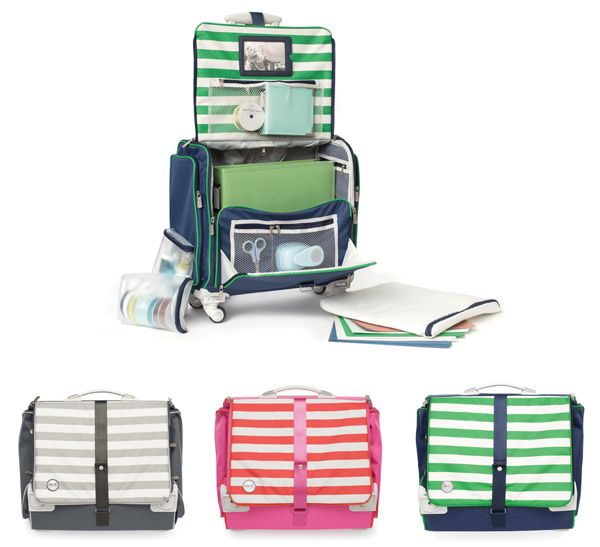 The new bags come in three very delightful colors – gray, pink + coral and a preppy green + navy. 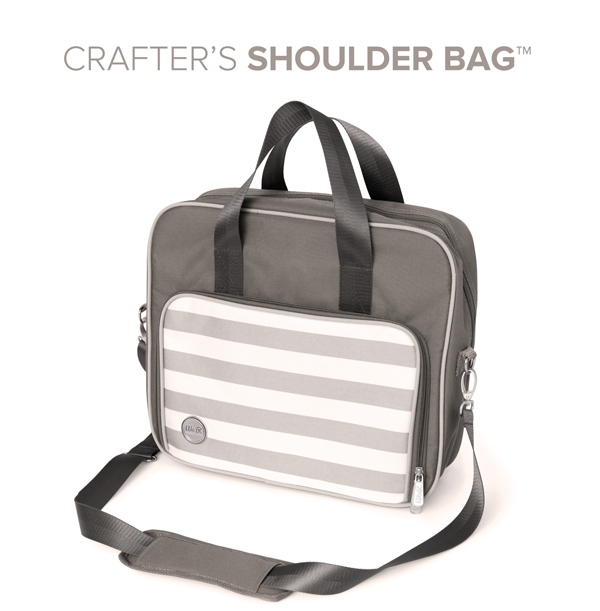 In addition to the 360 Crafter’s Bag, we’re also releasing three smaller accessory bags. And the piece we know you’ll really dig – the cup holder. The perfect size for that outrageously large Diet Coke you like to have on hand! Want a closer look at these lovelies? After watching that, can you believe how much this compact bag will hold? The 360 Crafter’s Bag retails for $119, while the Crafter’s Shoulder Bag is priced at $39.99 and the Crafter’s Cup Holder is a cool $7.99. 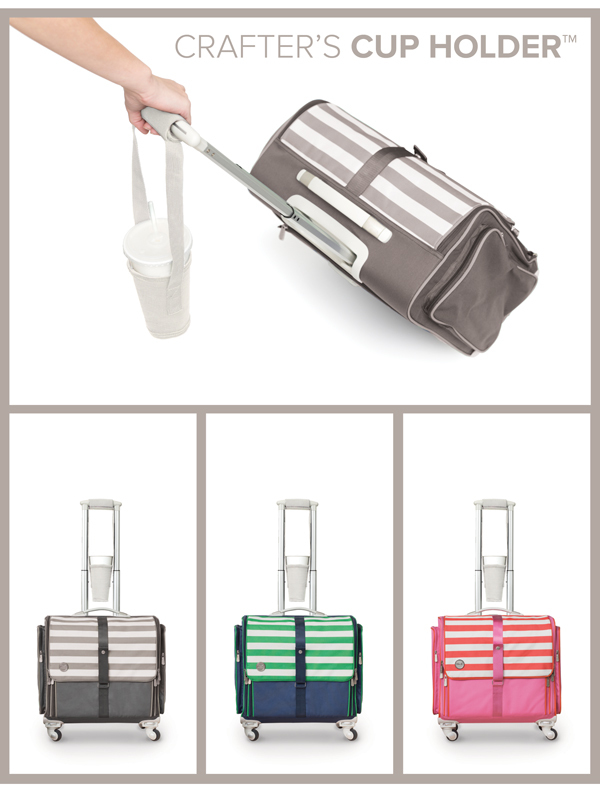 All of the new bags will ship to retailers in February! Who’s excited about this pretty craft room on wheels? We love sharing a specialty line every once in a while. Cakes + Candles is a classic take on birthdays, that will have you ready to PAAARTAY! The best part? The design is perfect for both boys and girls. Cakes + Candles will ship to retailers beginning in February! Would you like to win the Cakes + Candles collection? Leave us a comment and let us know what you like best about this line. Bright colors headline this fun paper collection, that boasts 12 double-sided cardstock papers, 12×12 and 6×6 paper pads, cork and enamel stickers, alpha blocks and ephemera. Would you like to win the full collection? Leave us a comment letting us know how you’d use an every day collection like Hello Darling.